Going back to last August, 10 of our Scouts accompanied Tanworths lone cub to the district cub camp in Dorset. We had a fantastic week hiking to the beach, sailing, practicing survival skills and visited Brownsea Island and Beaulieu Motor Museum. In October we entered 4 Scout and 2 leaders teams in Redditch districts ‘The Trek’ hiking competition. Teams of 3 Scouts, unaccompanied by leaders, have to navigate their way between 16 bases spread around Inkberrow, completing challenges at each base. We didn’t win any prizes this year but all our teams finished within the time limit having visited the required number of bases. This was a real achievement when half the teams were disqualified for failing to finish on time. The Trek is becoming a highlight of our Scouting year and we already have 4 teams signed up for this years event. We competed in the district Swimming Gala at Abbey Stadium and helped to win the Group trophy for Tanworth. In November we once again made up Cub numbers sending 6 Scouts to their Winter camp at Beaudesert near Cannock. In December we entered a team of 4 in the district Scout Quiz and won. We also packed bags at Sainsburys in Shirley, raising £500 towards new camping equipment. In March we entered a team of 8 Scouts in the districts Dovetrek hill walking competition in the Peak District and won. This was an amazing achievement for the Scouts who had to navigate 10 miles over some very difficult terrain and complete challenges at each checkpoint they visited. Not only were our team the first to complete the route but when they had finished they wanted to walk a further 2 miles up a very steep hill to help Karl and myself carry our equipment back off the hill. Most of the Spring term was spent learning survival skills which we put to the test in April by stranding the Scouts in a wood near Coventry with only a tarpaulin, knife and coconut as equipment. After Easter we had a visit from Shelterbox, showing us the equipment they send to disaster zones and telling us about their work. A couple of weeks after their visit Nepal was hit by an earthquake and the Scouts decided they wanted to do some fundraising for the disaster relief. We spent a meeting baking cookies which the Scouts took home to sell. In total they raised an amazing £325 which we donated to the Disaster Emergency Committees Nepal appeal. 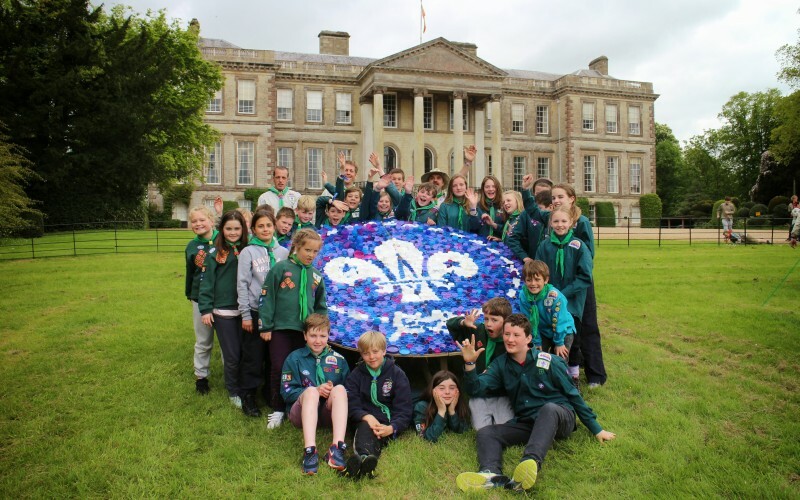 In May we joined 4,000 other Scouts for the ‘Get In’ County camp at Ragley Hall. All but 3 of the Scouts attended and took part in activities including sailing, canoeing, archery, rifle shooting, 44 offroading, go carts and most exciting of all… making igloos out of milk bottles. We also invested 4 new Scouts on a climbing frame which was interesting. The Scouts had a great weekend. I’d like to say a huge thank you to Ann & Jo for managing the cooking and all the parents who helped over the weekend with the craft activities. Throughout the year we have been taking part in activities in remembrance of the centenary of the First World War. These started with a parade and wreath laying in the village last year and culminated with a visit to the National Memorial Arboretum and Staffordshire Trenches, near Lichfield, last Saturday. Thank you to Tanworth Parish Council for organising the trip. Over the last year the Scout section has grown from 18 Scouts last June to 21 today having lost 3 Scouts and gained 6. We have a 50% split between girls and boys. Realistically with the size of hut and leader team we have we can take a maximum of 25 scouts and we will reach this with the Cub intake this September. Priority for places at Scouts is given to members moving up from Cubs and as it stands our projections push us over our limit of 25 for the foreseeable future just from Cubs. We currently have a waiting list of 14 Scout aged children wanting to join the Scout section from outside the group and with the closing of Guides last April this situation is only likely to increase. On the plus side the closing of Guides has left the hut with a free night on Thursdays and we have enough prospective Scouts to fill a second Scout section. The only thing we don’t have is leaders to run it so if any parents, grandparents or friends would be interested in helping please come and talk to us. I’d like to say thankyou to all our Scouts for being a great troop. They take part in everything, be it troop meetings (which usually have 100% attendance) or weekend activities, and they do so with enthusiasm. They make being a Scout leader fun and incredibly rewarding. Finally I’d like to say a huge thank you to Karl & James for all their help in running the Scout troop. They put a lot of time and effort into delivering which is all voluntary Scouts and none of the events I’ve listed above would be possible without them.